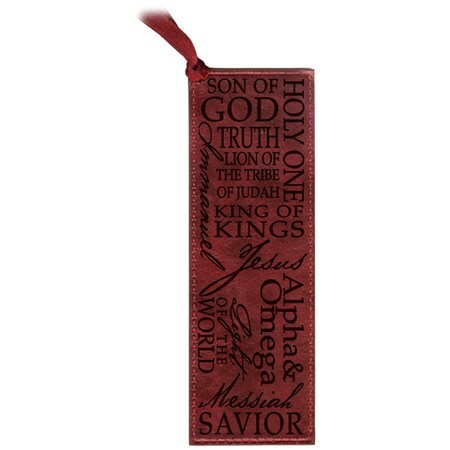 Luxurious bookmark with debossed graphics and sentiment, 2" x 6.5" with ribbon corner loop; packaged in attractive PVC pouch; an appreciated gift for readers and Bible scholars. Give one with every book and gift Bible! Luxleather faux leather bookmark. Two-tone brown with names of our wonderful Lord motif; Son of God, Holy One, Truth, Lion of the tribe of Judah, Immanuel, King of Kings, Jesus, Alpha and Omega, Light of the World, Messiah, Savior.